It is possible to improve energy in chronic Lyme disease by improving the function of the cell power factories called mitochondria. For many with Lyme, the mitochondria get injured and do not produce enough energy. But there are effective steps to take that fix the damage and give energy back. Mitochondria are the energy factories found in every cell in the body. By some estimates there are nearly 400 per cell. In chronic Lyme disease or in toxicity issues, due to oxidative stress the mitochondria can be injured leading to fatigue that will not improve. In oxidative stress chemicals build up that can damage membranes and even the DNA genetic material of mitochondria. 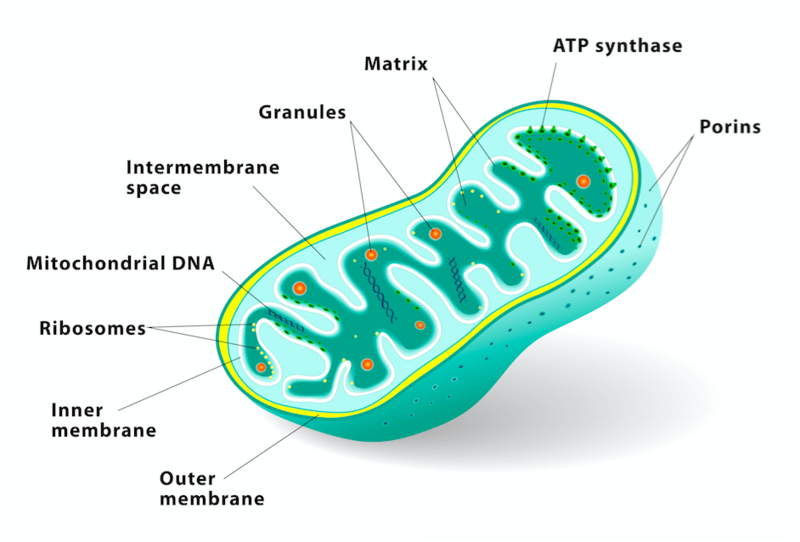 As power factories, mitochondria create a type of cell fuel called ATP. This is created as fat and sugar are burned through a number of chemical reactions called Kreb's cycle and another process called oxidative phosphorylation. The fuel sources for mitochondria are fat and sugar. Both need to be transported to the inside of the mitochondria. Take steps to improve mitochondria function if essential steps to treat Lyme do not provide good improvements in energy by 6-9 months. For these essential steps see Fix Fatigue Boost Your Energy: The Basic Steps. The recording is a Lyme Byte from our Lyme Q & A webinar series Conversations with Marty Ross MD recorded in September 2016 when Dr. Ross practiced in Seattle, Washington. In this recording Dr. Ross talks about repairing mitochondria and nerves. The steps to repair mitochondria are identical to those to repair nerves. In mitochondria dysfunction the outer membrane of the covering can be injured. This membrane is composed of a phospholipid fats called phosphatidylcholine and phospatidylserine. A healthy mitochondria covering is needed for two reasons. First, this covering transports fat and sugar to the inside to be burned into cell fuel. Second, a number of chemical reactions take place on the inside of the covering requiring electrons to be transferred to them. There is a proprietary mix of phospholipids called NT Factor which may repair the nerve cell and mitochondria membranes. It includes phospatidylcholine and phosphatidylserine. Read more about NT Factor Phospholipids on this site. A study shows average energy improvements of 40% by using NT Factor for 2 months. In the same study, participants also reported clearer thinking. NT Factor Phospholipids 2 pills 3 times a day for 2 months then 1 pill 3 times a day for 4 more months. Glutathione is a powerful antioxidant that repairs cell injury. It is made in every cell. Liposomal glutathione is best. This type of glutathione is microscopically wrapped in phospholipid fats which increases its absorption. One can also breathe glutathione in using a nebulizer or take it by IV. The nebulizer and IV versions may work more effectively in some than the liposomal oral form. Read more about the nebulizer and IV versions including dosing and how frequent to take them in the article Glutathione: The Great Fixer. An alternative to glutathione is to take a building block of glutathione called N acetyl-cysteine (NAC). Inside cells NAC is used to make glutathione. My preference is the glutathione but in some it does not work or is too expensive. N Acetyl-Cysteine (NAC) 500mg 1 pill 3 times a day. Co Q10 is a key nutrient used in chemical reactions inside mitochondria that create cell fuel. Most people do not get enough of this essential nutrient in their diets. Co Q10 400mg 1 pill 2 times a day. Carnitine is a transport vehicle that carries fat to the inside of a mitochondria so that it can be burned into cell fuel through chemical reactions. The key source of carnitine is red meat. So if a person does not eat red meat, they may not be able to fuel up mitochondria. The most absorbed and used source of carnitine is acetyl-l-carnitine. Acetyl-L-Carnitine 500mg 1 pill 2 times a day for 1 month and then 1 pill daily. To repair mitochondria and to boost energy try the Mito Food Plan developed by the Institute for Functional Medicine. This diet is a modified paleo diet. For more information about this diet and how to build it for you read The Best Brain, Inflammation, Pain, Energy, and Detox Diet Ever. Heavy metals like lead and mercury can injure nerves. By six months doing the above, if there is inadequate improvement, then consider testing for heavy metal toxicity. If heavy metals are elevated then a chelating agent can lower the metals. Read more in Heavy Metals: The Problem and Best Test. Mitochondria repair takes time. Give this recommended protocol at least 6 months to see if it will help. The ideas and recommendations on this website and in this article are for informational purposes only. For more information about this, review the sitewide Terms & Conditions.